By Jennifer Ashawasegai Windspeaker Contributor NIPISSING FIRST NATION, Ont. It’s Nibi in Ojibway, Nipiy in Cree, Samqwan in Mi’kmaq, and other nations have their own word for it. We all know it by the English word, water. We also know how important it is to life. We’ve heard about how pollution has caused changes to fish, and we can’t eat as much of the staple as we used to because of it. Some First Nations member can’t even drink their water. As of April 30, Health Canada reported that 122 First Nations in the country were under various types of water advisories. First Nations communities in northern Manitoba are without running water. Four First Nations in the Island Lake region were the subject of an investigative series by the Winnipeg Free Press earlier this year to shed light on their water woes. The United Nations General Assembly passed a resolution last year declaring the human right to “safe and clean drinking water and sanitation.” More than 100 countries voted in favour, while 41 countries, including Canada, abstained. Water is something we can’t live without. And one Anishinabe grandmother has been doing something for water. 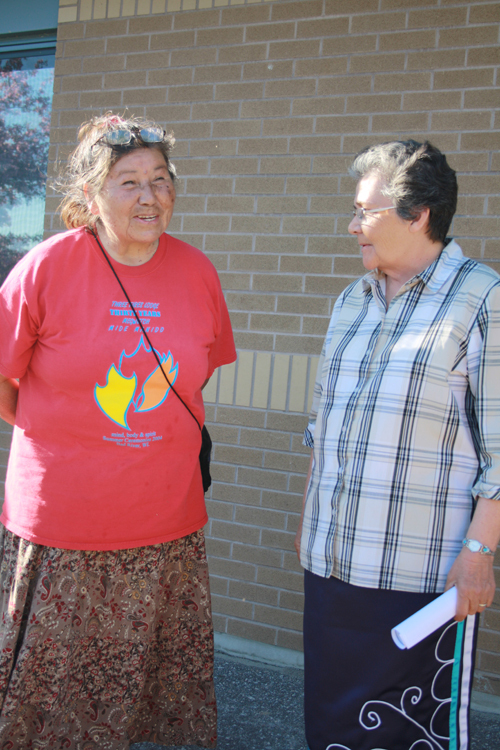 Grandmother Josephine Mandamin and her sister Melvina Flamand initiated the Mother Earth Water Walk to pray for water’s health and promote awareness that water needs protection. This year marks the eighth walk for the pair. They, along with a group of Anishinabe women, plus other supporters, walked around Lake Superior in Spring 2003, around Lake Michigan in 2004, Lake Huron in 2005, Lake Ontario in 2006, Lake Erie in 2007, Lake Michigan again in 2008 then around the St. Lawrence River in 2009. This year, the walk, which began in early April, was much larger. Water that they carry with them on the walk was collected from the four directions. At an overnight rest stop in North Bay on May 27, Grandmother Mandamin said water was collected from the Pacific Ocean, the Atlantic Ocean, Lake Superior and the Gulf of Mexico. But, the water collected from the Gulf of Mexico wasn’t particularly healthy. The largest oil spill the world has ever seen occurred there last year. A sea floor oil gusher exploded on April 20, 2010, which killed 11 men and injured 17 others. Over a three month period, it spilled a reported 172 million gallons of oil into the ocean. That’s enough to fill nearly 300 Olympic sized swimming pools. Right now, just over a year later, reports indicate oil continues to wash ashore, and the spill is being indirectly blamed for the deaths of more than 150 bottlenose dolphins this year. “When you look at that water, it’s almost like it’s embarrassed by what it looks like. And you feel really bad for it, that it’s been so depleted of its original energy by the pollution,” she said. The water from the oceans was mixed into Lake Superior with a Midewahnikwe water ceremony on June 12 near Bad River, Wisconsin. For Grandmother Mandamin, awareness about water is more than just environmental. It’s also spiritual and cultural. Mandamin advises that bodies of water must be given their original Indigenous names back. The original names are embedded with instructions for water, and how it’s supposed to work she says. She paints a bleak picture of an eventual dry landscape if people don’t begin to work together on the protection of water. Through her walks of awareness, Grandmother Mandamin is trying to get the attention of leadership and corporations. To really understand the importance of water, Grandmother Mandamin recommends people learn to have a deep appreciation of it by fasting to know what it’s like to be without water, and to use it in a good way. Mandamin says using water in a good way means thinking consciously about how water is being used. She says people need to question how they are using it and whether they are working at conserving water. Photo caption: Grandmother Josephine Mandamin (left) is welcomed to Nipissing First Nation by Chief Marianna Couchie. The community held a feast in honour of nine Eastern Water Walkers.